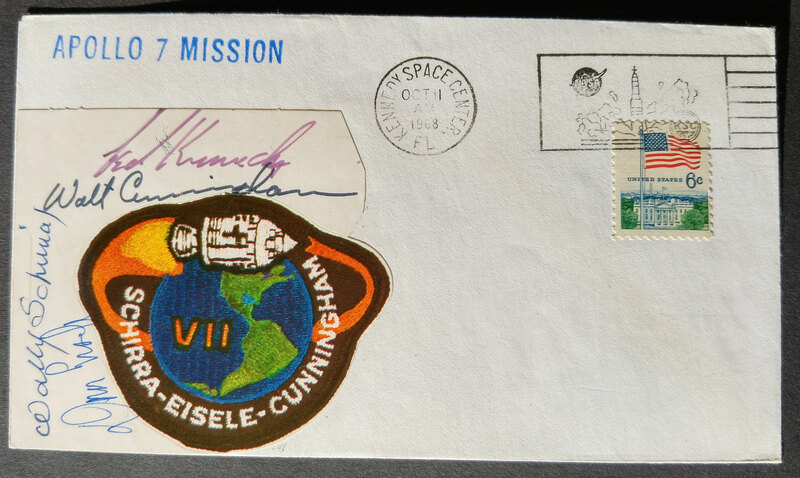 This is an Apollo 7 crew and Ted Kennedy signed cover that I listed for sale on eBay: Shortly after listing, I received a message (from a member of this forum as it turns out), questioning the authenticity of the signatures, in particular, that of Schirra. I don't want to sell potentially fake material, so I decided to remove the item from sale, at least until this concern has been satisfactorily addressed. I am hoping that by posting this topic, it will generate an interesting and open debate to help me determine the authenticity (or otherwise) of the signatures. The cS Forum member who expressed his concern, agreed that this was a good way forward. When I bought the cover (on eBay), it came with no supporting provenance but I did some research which gave me a reasonable degree of confidence that the signatures were genuine. I've tried to explain this below: The signatures appear to have been applied to a sticky back sheet with a peelable mission insignia. I think some, if not all were signed before the sheet was "cut" and applied to the cover envelope. This is because there is no trace of the Kennedy signature extending onto the envelope and the right-hand edge is shaped around the top signatures. The top edge has several small triangular projections suggesting this could have been a sheet containing multiple mission insignias, or other peelable items and was machine cut to provide a natural tear line. (Is anyone familiar with these type of sheets?) There is also a short straight ridge impressed into the sheet from below, just above the Schirra signature. This looks like it was there when it was signed. The ridge is not visible on the back of the envelope. There is a fine pencil line running at a tangent to the edge of the insignia below the Eisele signature. "EISELE", pencilled in capitals, is just visible on this line at the bottom of the envelope. The "o" in "Donn" is normally quite flamboyant, but unusually, almost appears to be missing. I think it may be squeezed into the upright of the "n". The example below shows what I mean, although nowhere near as squashed: Otherwise, the signature looks to me to be an excellent example. I asked myself, if the signatures were not genuine, why would they be applied to a "cut" rather than directly to the envelope? Why not just peel off the mission insignia and stick that to the envelope? Much tidier, and it could have been placed more strategically. A couple of the signatures, overwrite the insignia, but the brown coloured portion has a sheen and a waxy feel to it. The "g" is not visible on this brown area and I have a theory that this ink may have remained wet for longer and got rubbed off, possibly resulting in the smudge over the "d" of the Ted Kennedy signature. The "h" in the Cunningham signature seems to be achieving the impossible. It overwrites the Kennedy signature on the upward stroke, but then appears to be overwritten itself, only to overwrite it again on the downward stroke. I guess it's possible the pen left the paper at the top of the "h", but it's a bit of a puzzle. Anyone care to comment on this phenomenon? 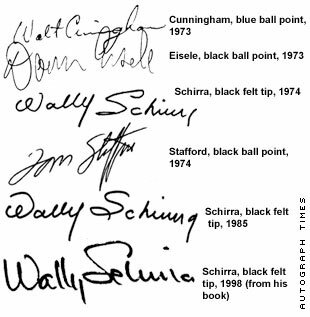 Wally Schirra's signature is anomalous, missing several traits seen in the vast majority of his signings. It shares many similarities to some of his early autopens, but I don't believe this to be an autopen and I'm not aware of a secretarial. Can anyone clarify this? The vertical line at the end of Wally's name on this cover, is one of the features that I've seen on quite a few of his more irregular signatures. One of his autopens has a more elaborate version of it and I'm not sure whether it's his way of writing Junior (Jr) or perhaps even a Mercury 7 symbol. (Can anyone throw any light on this?) It's one of the indicators which in my mind gave it some credibility. Some of his signatures have a vertical line extending down from the "a" in Schirra, which I believe is meant to be the same thing. 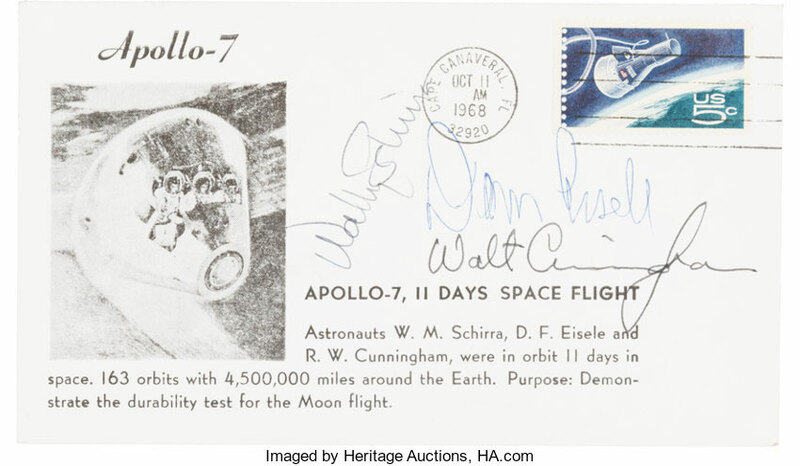 The clincher for me, was an article I found, which appeared in the April 2000 edition of Autograph Times entitled "Building an Apollo Collection" by Dr. William Hanson. In it, he includes Schirra signature examples, which he states are genuine, a couple of which are very similar to the one on this cover. See below: I'm sorry if I've waffled on a bit. If you managed to get this far, I hope it's made sense enough to provoke a discussion.